With just under 70g of protein in this quiche, and not a meat ingredient in sight, our Spinach & Red Pepper Quiche is a great way to boost your daily protein intake, without the added fat, calories or carbs found in most quiche recipes. Enjoy as a low fat high protein breakfast, eat on the go as a low calorie snack or serve up as a macro winning lunch or dinner. 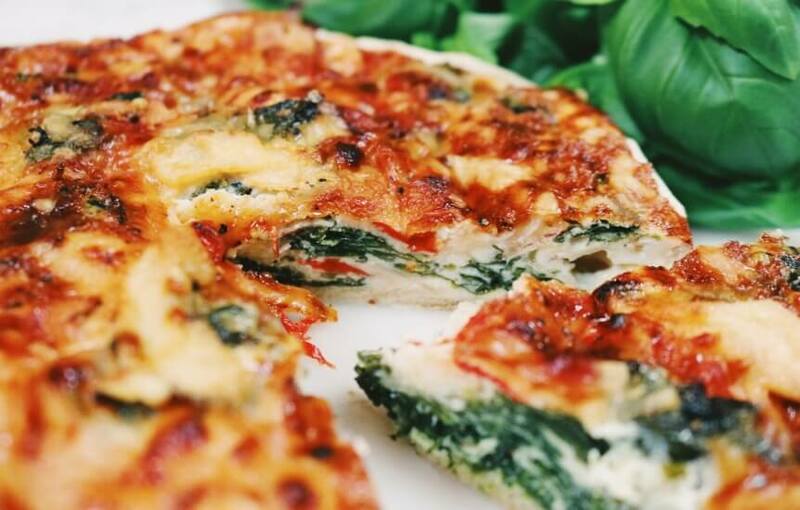 Our Spinach & Red Pepper High Protein Quiche recipe offers up 56% fewer calories, 85% less fat, 73% fewer carbs & a 98% increase in protein in comparison with Higgidy’s Spinach, Feta & Roasted Red Pepper Quiche. So how do we create such a macro friendly recipe? It’s all down to the simple witch up ingredients in our Eatlean Quiche Kit, which holds all of the perfect ingredients to get your high protein quiche recipes started! Lo Dough – Low carb, fat free, low calorie, high protein….do we need to say any more?! A great alternative to fresh pastry, our Lo-Dough bases are the way forward, and the nutritionals are astounding!